Dockless scooters have significantly increased in popularity since being released in late March. Several Bay Area cities, including San Jose, are grappling with how to regulate the dockless ridesharing companies. There are several concerns about the safety of using dockless scooters. People can unlock these 25-pound electric scooters by finding one and paying to use it through a mobile app. Bird, Lime and Spin operate these services in the Bay Area. 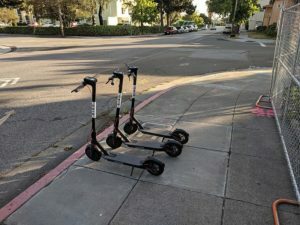 After people finish using the dockless scooters, they can leave them just about anywhere – including trees and trashcans. This is part of the reason why there is a controversy over the dockless scooter craze. Users are also reportedly dumping scooters on busy sidewalks and in front of homes and businesses. There are reports of users riding scooters in areas with heavy foot and vehicle traffic. Social media users have posted reports of dockless scooters with the brakes cut or smeared with feces. Reports of injuries and other problems in San Francisco led city planners to temporarily remove scooters from the streets in early June. San Jose did not issue a temporary removal of dockless scooters like San Francisco. City officials may require dockless scooter companies to pay a deposit to cover damage to city property. Scooter companies may also have to pay annual fees to operate in San Jose. San Jose police may be used to cite people who are riding scooters on sidewalks. Can I File a Lawsuit for a Dockless Scooter Injury? Depending on the circumstances, it may be possible to recover compensation if you or a loved one suffer an injury while using an electric scooter. There are other scenarios involving dockless scooters where it might be possible to recover compensation for an injury or loss. Bohn & Fletcher is a San Jose personal injury law firm that takes accident cases throughout the Bay Area. If you or a loved one suffered harm while using a dockless scooter and have questions about your legal options, you can schedule a free consultation with one of our attorneys. Call us at (408) 556-9780 or use our online case review form.